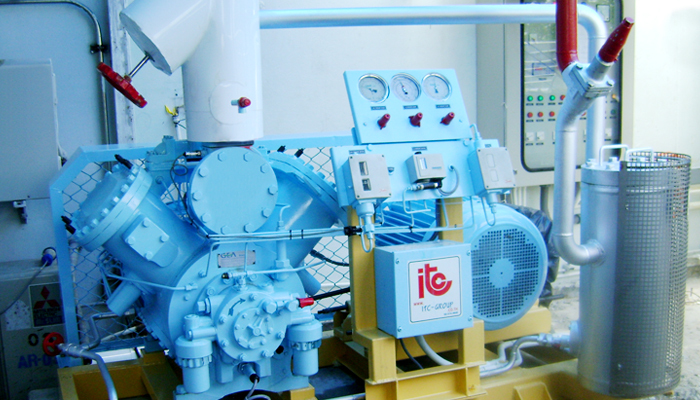 Belt drive reciprocating compressor designed for single/two stage compression refrigeration system. The package complete with high efficiency oil separator, suction accumulator, control panel and pressure controls. Composite material suction and discharge valve plates ensure high efficiencies and long service life. Optimum valve selection for different conditions. Increased flow capacity, high robustness of the dynamically loaded component. Hydraulic valve lifting mechanism for individual cylinders. The lubrication system consisting of the oilpump, oil filters and oil pressure regulator is a selfcontained module without any external piping. High quality low load radial and axial bearings with excellent sliding and running properties ensuring low wear. Light metal aluminimum alloy piston and connecting rod. Easily removable via the top of each cylinder. Each piston is fitted with three specially coated rings ensuring low wear and low oil carry over. A perfect gastight oil cooled seal guarantees long service life. The unique concept of using welded steel crankcases, which is proven in more than 40,000 Grasso compressors helps to keep discharge temperatures within limits.